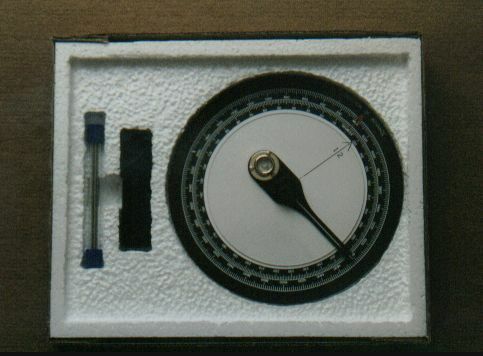 Following my research on the Web, I was able to acquire a solar compass of this type, thanks to Tony Payne of the UK. This compass was bought in a second-hand store and comes from the surpluses of the British army. It carries an inscription " BTO/3/91 " which seems to be the date of manufacture. The plate is made out of an aluminum alloy and the transparent discs out of plastic. It is a model MKIII, and thanks to the Imperial War Museum of London, we were able obtain a copy of the instruction manual of the model MKII from which the following information is drawn. A Circular Time Plate,a white plastic disc, which revolves independently on the circular bearing plate. Usually, it has an index line, marked '12' and drawn as a radius from the centre. The index line is used as a 1200 hours (midday) baseline for drawing other lines to represent times of the day. If the index line is not engraved on the plate it can be drawn in with a pencil. A Slotted Ruler, pivoting on the centre of the circular bearing plate to form a radius. When clamped down it holds the circular time plate (plastic disc) in position. Spirit Level. In some models the spirit level is incorporated in the pointer, on the opposite side of the gnomon to the slotted ruler, as shown in the illustrations. In other models it is fitted on the outside edge of the bearing plate. 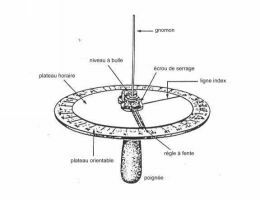 A Gnomon, mounted vertically in the centre of the circular bearing plate around which the slotted ruler and time plate can revolve. Mountings. The instrument can be mounted on a vehicle or hand held. Its box, which contains spare gnomons, may be screwed on to the vehicle for better security. 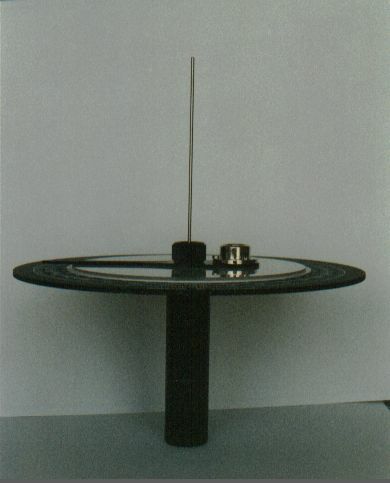 The Howard's sun compass must be correctly oriented and secured to the vehicle for use when mounted. 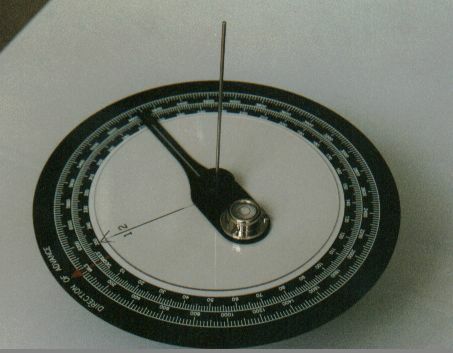 Although the Howard's compass is easier to set up than the Cole's, shadow angle lines must be redrawn on the circular white plastic time plate at fortnightly intervals. Dismounted, orientation is even simpler. Shadow Angle Table. Choose the table at the end of this Appendix appropriate to the latitude and date. Turn the circular plastic time plate so that the 12 Index Line points to the 0° mark and the Red Directional Arrow on the outside rim of the bearing plate. If no lndex Line has been marked on the plate, pencil it in. 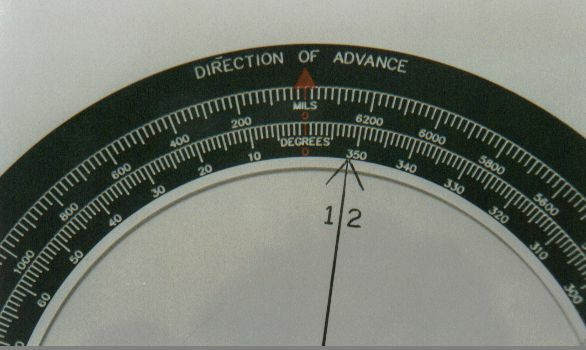 Draw the Shadow Angle Lines on the circular plastic time plate using the slot in the compass pointer as a ruler. With the Index Line pointing away from you, pencil the morning Shadow Angle Lines in to the left of the Index Line and the afternoon lines to the right of it. The table gives the bearing for each half-hourly Shadow Angle Line to the east or west of true north, 0° on the bearing plate. Note the figure, in minutes, for the appropriate latitude and date shown in the second column of the Shadow Angle Tables. This figure must be added to or subtracted fro m the halfhourly Shadow Angle Lines when setting the compass to march or drive on a bearing to allow for the discrepancy between Local Apparent Time and actual sun time. Clamp the sun compass to the hole in the vehicle bonnet using the spirit bubble to level it. Re-set one watch to Local Apparent Time (LAT) and the other to GMT or LMT (for radio time signals). TO DRIVE ON A BEARING. Rotate the circular plastic Time Plate until the Index Line points to the bearing on the rim of the Bearing Plate and clamp it. The compass is now set for 'Index on Course'. 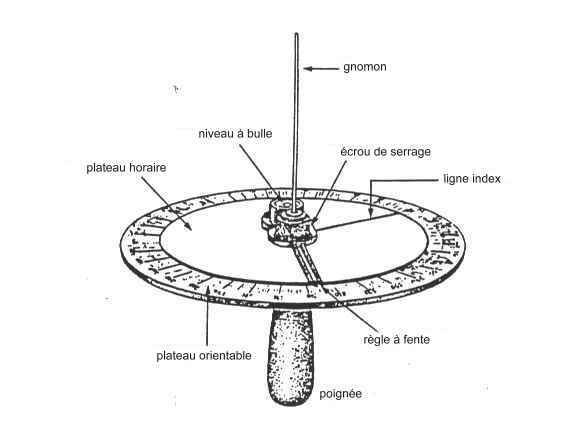 Turn the vehicle (or, if dismounted, just the compass) until the gnomon's shadow coincides with the local apparent time on the circular plastic Time Plate. The compass is now set for 'Shadow on Time'. a. The 0° mark and Red Directional Arrow now point on the bearing required for the move. Pick up a feature along the bearing and drive towards it. If it is possible to line up two features, one behind the other, keeping direction will be much easier, particularly if minor detours round patches of bad going are necessary. b. On arrival at the first steering mark, line up the gnomon 'Shadow on Time' again, pick out another steering mark in line with the gnomon and Red Directional Arrow, 0° mark, and drive on. c. In featureless country where there is no convenient steering mark the navigator and driver must keep direction by keeping the gnomon's shadow along the Slotted Rule Pointer. 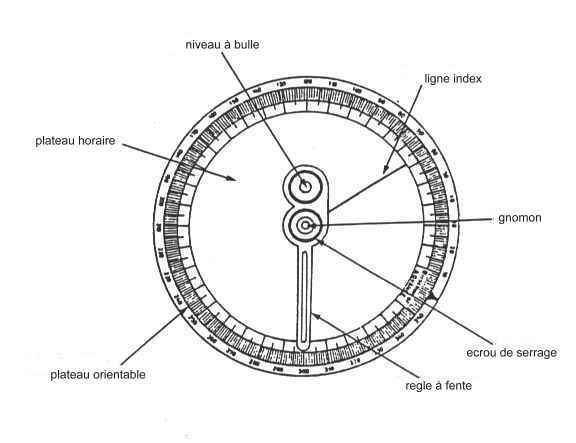 The Pointer should be moved round the circular plastic Time Plate once every 15 minutes to keep the shadow in step with the navigator's LAT (sun time) watch.